The West Michigan Park Flyers Skinny Dipper was designed to be a fully 3D aerobatic Float plane and it fits the bill quite nicely. If you want to fly 3D or just cruise around and do touch and goes on the water or snow the skinny dipper has the ability to adapt to your flying style. It has a full box fuse not commonly found in a profile style foamy design. 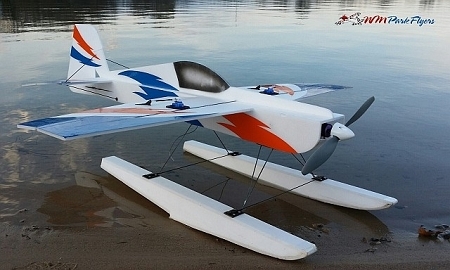 This design makes for a very rigid crisp flying airplane that is sure to please. Included in this kit is all the laser cut foam, pre-bent 2mm dia. Piano wire landing gear, Carbon for reinforcements as well as laser cut wood control horns as well as all the hardware and carbon needed to build the air-frame.